and double- or triple-pane glass—our all season rooms are among the most energy-efficient sunrooms on the market today. Finally, for those of you who want to create a four season space on your existing deck or patio slab, we offer a modular insulated roof & walls system that the average homeowner can actually assemble themselves. 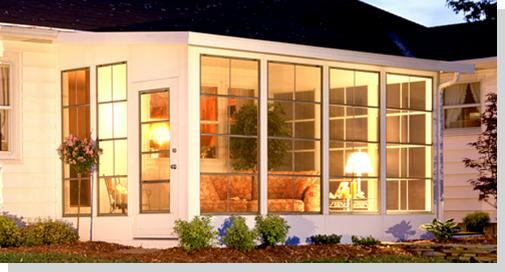 With over 70 years in the industry C-Thru Industries offers the Alpha™ and Omega™ sunrooms. With an available variety of roofs, doors, walls, and customization options you can create an affordable 3 or 4 season sunroom perfect for your lifestyle and budget! C-Thru manufactures all sunroom components, windows and doors under one roof keeping all quality assurance in house! We are working to provide the highest quality, durable and maintenance free materials - - all at a price that will not break the bank and it comes with all the help you need from Home Porch & Patio Kits Inc. The Alpha™ sunroom line is constructed with our 3 1/2” thick insulated aluminum wall system. Sitting on top of your walls is our exclusive patented roof lock WeatherGuard structural insulated roof system. Available in 3", 4" and 6" thick roof panels. This allows you to design your sunroom for your particular climate. Whether it's hot and sunny most of the time or if the deep snows of winter are your concern, our WeatherGuard roof is your solution. Designed as a cost efficient alternative to 'stick building' a full addition, it is our most economical modular sunroom line. Generally speaking it is perfect for 3 season type applications. Ideal for adding that additional living space while watching your budget. The Omega™ Sunrooms Line offers our ultimate, most energy efficient sunroom. With the insulated Omega 4" vinyl 'thermal clad' wall system we provide most energy efficient modularized sunroom available on the market today. The wall panels, windows, doors, roof and electrical systems are all tested and scrutinized by 3rd party evaluation labs such as IAPMO, ICC, UL, AAMA and NFRC as well as government and state agencies. Refined and beautiful, Omega™ sunrooms' thermal cladding system hides all visible screws and caulking - -all windows and doors are vinyl and are NFRC rated and AAMA approved. To top it all off our patented roof-lock WeatherGuard panels are engineered for your loading requirements and retain the elegant look you are going for in your 4 season sunroom. 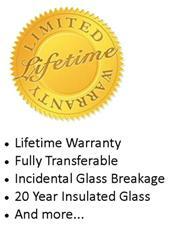 Our Lifetime Limited Material Warranty is unequalled by any other sunroom maker. Your new C-Thru Sunroom is warranted for life, as long as you own it!